This story was first posted on the KQED Arts website. Reproduced courtesy of KQED. 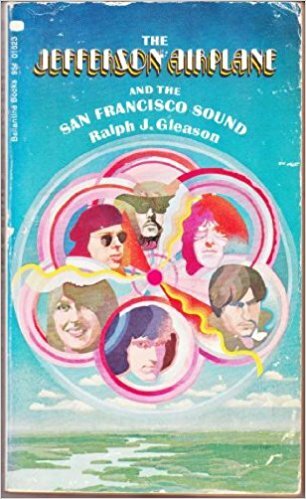 Back in the late ’80s, I found Ralph J. Gleason’s paperback The Jefferson Airplane and the San Francisco Sound for $3 at San Francisco’s Green Apple Books. I never thought the next copy I’d see would be in a glass case in a Summer of Love exhibit at the California Historical Society — a testament not only to the book’s rarity, but to the sky-high esteem in which the era is now held as it marks its 50th anniversary. Although more modest in scale than the de Young’s current Summer of Love extravaganza, the California Historical Society’s current exhibition On the Road to the Summer of Love, running through Sept. 10 in downtown San Francisco, offers important context through photos, memorabilia, and audiovisuals. (And at $5, the price is right.) Rooms on the Beats and the Free Speech Movement trace the Bay Area’s proudly rebellious bohemianism back to the late 1950s and early 1960s. 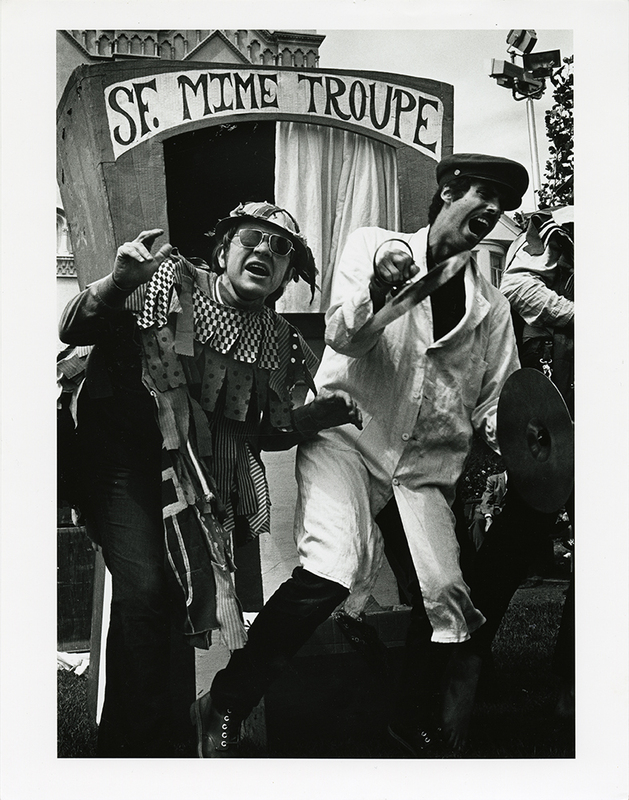 The folk revival (check the pictures of a pre-rock Janis Joplin and short-haired Jerry Garcia and Jorma Kaukonen), the San Francisco Mime Troupe, and the experimental music of the San Francisco Tape Music Center all get their due as vital forces in the city’s simmering volcano. Some of the images will be familiar to visitors well-versed in the time and place, whether it’s Joplin at the Monterey Pop Festival or the “Death of Hippie” procession down Haight Street in fall 1967. However, many pictures are uncommon, even some of the ones that are focused on celebrities. For instance, major collectors might not have seen the poster for a pre-Janis Big Brother & the Holding Company benefit show for Berkeley’s Open Theater, or an ad for the “Jefferson Airplane Loves You” fan club (housed at “Jefferson Airport” in Millbrae, $1 entitling members to a “Far-Out” Flight Card, among other goodies). The Free Speech section features not just the expected shot of Joan Baez, but also a couple shots of folkie Barbara Dane, who was probably even further to the left of Baez. Both the Airplane and Big Brother made big splashes at the Monterey Pop Festival, and photographs of them and others in action at the event make their expected presence. But so do color shots from the Fantasy Fair and Magic Mountain Music Festival, a much smaller yet almost equally vibrant festival on Mount Tamalpais held the weekend before Monterey. Other artifacts remind us the new dawn was far from universally welcomed, whether it’s a somber Lawrence Ferlinghetti standing in front of a “Banned Books” window display at City Lights in 1958, or an issue of Record, the neighborhood Haight-Ashbury paper, headlined “SUPERVISORS FACE HIPPIE AVALANCHE” nearly a decade later. For all the great music and charismatic figures around which the Summer of Love revolved, some of the most affecting relics remind us that many of the hundreds of thousands flocking to the Haight were ordinary, sometimes struggling youngsters. One shows a group of anonymous young guys – all with backs turned to the camera – looking over the city from a rooftop, some perhaps to make a big impression on the community, like the longhair on the left with a guitar. Others, perhaps, became some of the runaways who ended up on the streets, relying on free food giveaways by the Diggers to survive. 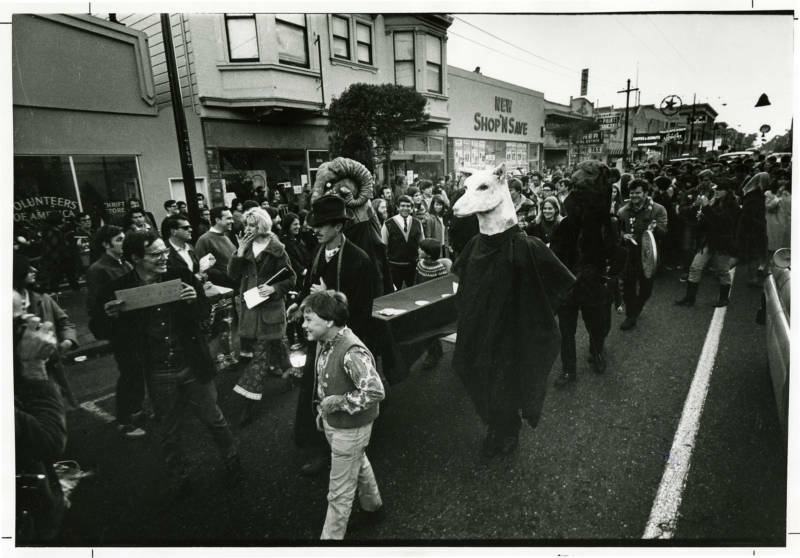 A contact sheet of pedestrian traffic on Haight Street shows a mixture of such street kids and hippies, as well as the odd pair of straight businessmen in suits somehow caught in the sweet madness that this exhibit revives. ‘On the Road to the Summer of Love’ runs through Sept. 10, 2017, at the California Historical Society at 678 Mission Street in San Francisco. For more details about the exhibit and corresponding events, see here.